Tuscany can boast beautiful art cities, countryside sceneries and medieval hilltop towns, but also fantastic seaside destinations and a wonderful sea coast. From north to south you can find lovely sea shores with rocky to sandy beaches with clear waters. A holiday at the Tuscan seaside is perfect if you love the sea, yes would still like to visit and explore Tuscany’s art treasures and the many charming villages near the coast. This relaxing B&B is located in between the seaside and the countryside. It offers nice and comfortable rooms and a large breakfast buffet in the morning. A lovely casale in Marina di Grosseto from which you can reach cycling the seaside, the bikes are offered by the structure. The countryside is all around and in the air you can enjoy the smell of the sea. 10 minutes to get to Castiglione della Pescaia. La Fenice hotel is situated in a 19th century mansion in Massa Marittima historical centre. All eighteen rooms, divided on three floors, offer all main comforts, as air conditioning, satellite television and mini-bar. This Maremma farmhouse is surrounded by a well-maintained Mediterranean garden. It offers 14 double rooms, each with their own private entrance. Guests can enjoy the colors and scents of southern Tuscany from the beautiful swimming pool and the garden. Nice apartments of different sizes located near the beautiful beaches, the restaurants and shops of Porto Azzurro on the Elba Island. This farmhouse offers four guest rooms for up to 3 persons with AC, green garden & homemade meals. Vacation activities, choose between the beaches of Monte Argentario, the thermal waters of Saturnia or the on site sport fishing lake. 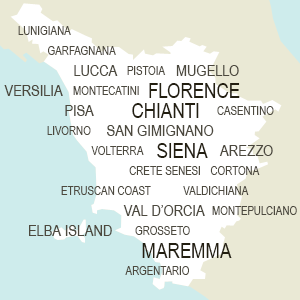 All the Tuscan Coast is amazing and can really vary a lot from place to place. You’ll find that each place has its own charme, starting from Viareggio and Versilia, passing on through Livorno and the charming Etruscan Coast, arriving to the fantastic Maremma region and further to the enchanting Laguna of Orbetello. You might also make day trips to the beautiful islands of the Tuscan Arcipelago, such as Elba, Giglio, Capraia, Pianosa and Giannutri. Not to be missed! The most beautiful and unspoilt beaches of Tuscany can be found in Maremma, the wildest part of Tuscany with an uncontaminated nature and fantastic environments. Here you may stay in a lovely agriturismo near the sea and embark on a number of interesting activities, both at the seaside or in the countryside. Crystal clear waters and splendid sceneries are only waiting for you!